I’m working hard on something that I want to tell you about. I’ve started the first Yellow Level Unit Study! Our Yellow Level is an all-picture-book curriculum focused on stories from history. The themes in these picture books are a little more serious and more difficult to understand than our Orange Level books and the go-along activities are just a little more challenging, though still age-appropriate and open-ended so that children can interact with the program at their own pace. Our desire to provide curriculum choices for children with learning challenges who struggle with the long list of writing assignments in other curriculums remains steady. Now, are you wondering what this new unit is about? That’s right! 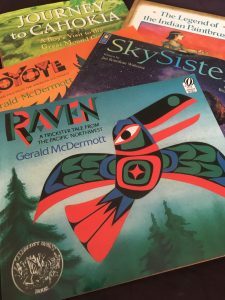 Our first Yellow Level Unit Study is a Native American unit with a wide variety of popular and easy-to-find books to introduce your child to the history of North America. I can’t wait to see this unit out in the world. I will let everyone know when it is ready on Facebook and Instagram. But the best way to stay up to date is to sign up for our mailing list. That way you won’t miss an update. We promise not to spam you and keep your information secure. Please sign up if you want to keep up to date with the happenings and new products from Five Senses Literature Lessons. Previous: Previous post: Does your child have symptoms of a learning disability? When to worry.